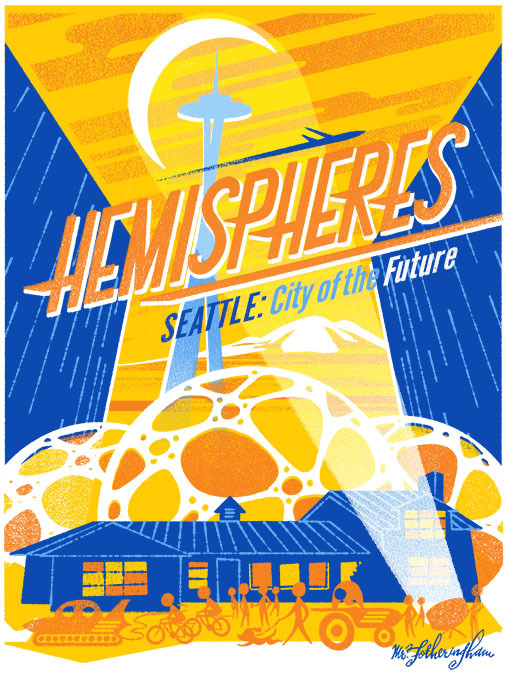 Hemispheres is planning an event where we will be celebrating Seattle’s past, present and future. In preparation for this, we worked with the illustrator Ed Fotheringham to create original artwork. We decided to approach this with a retro-futuristic style travel poster. It features the iconic Space Needle as well as the soon to be completed Amazon Spheres in downtown Seattle. Ed is a Seattle-based artist who has, among many other projects, created album art for Mudhoney and Elvis Costello, posters for Sub Pop and Bumbershoot, as well as illustrations for publications including The New Yorker, the Washington Post, and children’s books. You can learn more about Ed at www.edfotheringham.com. If you would like to learn more about Hemispheres, the poster, or the event, please contact us at hello@www.hemispheresinsights.com.